It’s a usual occurrence on the streets of NYC during rush hour: roads and intersections become obscenely congested with pedestrians and drivers trying to slowly navigate the crowded streets and make their way home. It is these moments where intersections not only become the most active and crowded spaces in the city, but also a prime location where drivers may be hit with a Blocking the Box ticket. What is Blocking the box? A long time ago, the city instituted the Blocking the Box law in an effort to help ease traffic and congestion especially during rush hour. Blocking the Box prohibits drivers from entering an intersection where there is not enough room to smoothly pass the crosswalk and proceed through the intersection without being forced to stop and therefore block the flow of traffic through the intersection. Watch out drivers, If you are caught blocking the box you will be given a summons with a side of a hefty fine. Is it a parking ticket or moving violation? It’s both! However, it wasn’t always like that. For years, Blocking the Box violations were only considered moving violations which police gave to offending motorist and carried a maximum fine of $150 as well as 2 points on your license. However, in 2008 the status of blocking the box changed under the Bloomberg Administration and now has the dual status as both a moving violation and parking violation. This means that both police officers and traffic agents can penalize you for this offense. Traffic agents don’t even need to pull you over for them to hit you with a parking ticket, they merely need to witness you violating the law and enter in your license plate number into their system and soon a ticket of $115 dollars will be mailed right to your doorstep. Unlike infractions issued by police offices, a parking ticket for a blocking the box violation does not add points to your license and affect your car insurance rates. Still, we rather you not get hit with any fine, so be patient out there drivers! With typing and texting becoming more prevalent in our daily lives, the art of handwriting is unfortunately fading away. On the bright-side, bad or illegible handwriting on your parking ticket can be a saving grace and invalidate the parking ticket you received! Traffic officers must record the right information down on the parking ticket they issue. Details such as the vehicle color, body type, manufacturer, plate type (do you have normal or vanity plates?) must be correctly noted. Be sure to verify that your license plate number as well as the state of your registration was listed correctly (if at all) on your ticket. If you see any inconsistencies or flat out missing information about your vehicle on your ticket, you may be able to walk away scot-free! 3.The information about the time and place ticket was issued is wrong. Make sure that the information about where and when you got your parking ticket is accurate. Did the issuing officer not specify whether you were parked in ‘Front of’ or ‘Opposite’ the address in question? Did the officer issue the ticket in the wrong county? (You got a ticket in the Bronx but the ticket claims it was issued in Brooklyn) Are the days/times of a regulation in effect incorrectly or simply not specified at all on your ticket? Did the issuing officer claim the ticket was given at 8:30 pm when in fact it was issued at 8:30 am? Or is the date the officer noted on your ticket wrong or not even specified? If you answer yes to any of these questions, your parking ticket is likely to be invalid. Running a Red Light worth it? As we all know, New Yorkers are always on the go and sometimes get carried away with living life in the fast lane. This is especially true when we’re behind the wheel and approaching a traffic light. We’ve all witnessed it or even done it ourselves: a driver before reaching an intersection puts the pedal to the metal on a yellow traffic light and inevitably blows a red light. Running a red light is one of the most common moving violations in the city because of this. Every New York minute is precious but is our need for speed really worth the possible moving violation for running a red light or worse? You may also be subject to an increase in your car insurance premiums as insurance companies consider drivers with many red light infractions more likely to get into a car accident. Getting caught on candid camera by one of the 200+ red light cameras found around the city is treated a little differently than getting stopped by an officer in traffic. A red light violation from a camera is treated almost like a parking ticket instead of a traffic infraction because it is more difficult for the city to prove who was actually driving. Still, the registered owner of the car is held responsible for the moving violation even if the owner wants the one running a red light and must pay a fine of $50 (plus $4 processing fee if you pay with a credit card). Unlike a traffic infraction, points will not be added to your licenses and the violation will not be reported to your car insurance company and cause an increase in your insurance premiums. However, if the registered owner fails to pay off the ticket, a default conviction with a $25 late fee will be imposed and the owner’s registration may eventually be placed on hold. So take a breather New Yorkers, running a red light may not be worth it and in the end can cost you more time and money! Nowadays , it seems like everyone is attached at the hip to their cell phones. Between phone calls, text messages and Instagram, we can’t help but whip out those phones whenever we get the opportunity. But remember NYers, there’s definitely a time and place for you to use your phone and it should never be behind the wheel! Not only is it absolutely dangerous, using your phone while driving can also do damage to your pockets. Operate a cell phone while a vehicle is parked and not in motion. Take a call with a hands free device. Hold a cell phone to dial a number, text or do any other function while the vehicle is in motion. So remember new yorkers, drive safely, be smart and never use your phone behind the wheel! Parking Ticket Tip – If you park here between the hours listed above, you MUST feed the meter. 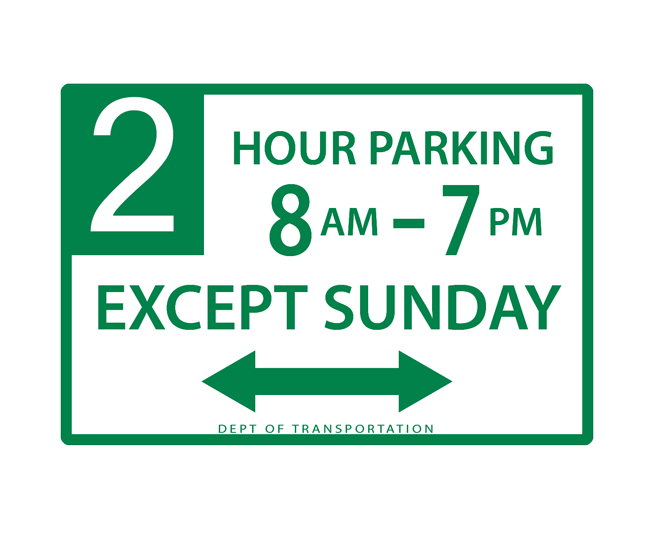 The “HOURLY PARKING” street sign means between that you can safely park your vehicle at that location. Please note however, that during a specific time period, (8am – 7pm in this case), you will need to put money in the meter and display a muni-meter receipt on your windshield. The #  in the top left corner tells you the maximum amount of time in hours you can pay for before renewing. The [8am – 7pm] tells you that you only have to feed the meter during this time. The [Except Sunday] means the rules don’t apply on a Sunday. You can park there all day without having to worry about receiving a muni-meter parking ticket. While it’s typical for the registered owner of a vehicle to dispute her or his own parking ticket, an eligible representative can also dispute a parking ticket on your behalf. If you decide to have an eligible representative dispute your parking ticket for you, make sure you provide them with all necessary documentation prior to your hearing. Remember folks, disputing a parking ticket may not be as stressful as getting one if you come prepared and have everything you need to support your claim! Although its always best to fight or pay off your parking ticket within 30 days, everyone knows that life doesn’t always work out the way we want. Whether you’re low on cash or just don’t have the time to pay, letting your parking violation collect dust in your desk drawer is perhaps the worst thing you can possibly do and might end up costing you thousands of dollars and countless headaches in the long run. Instead, take advantage of the parking violation payment plan provided by the NYC Department of Finance if it makes sense for you. You can start by checking if you have parking tickets on your vehicle by visiting this page. Paying your NYC parking tickets with a payment plan can help relieve some of the financial strain associated with many parking violations and may help you avoid penalties and enforcement actions such as additional late fees, having your vehicle towed or added to the dreaded boot list. This payment plan allows you to pay off large fines in small payments over period of time. However, keep in mind that at the end of the day you may being paying more money. This is because interest will continue to be added to the balance of your fine until the total amount you owe is completely paid off. For example, if you owe $1,000 and you choose a 2-year payment plan with 9% interest, you will end up paying a total of more than $1,100. Anyone can fill out the Payment Plan Request Form, however if you owe more than $10,000 in judgment debt, you will also need to fill out a Credit Application Form. Bring your completed form(s) to any Finance Business Center to enter into a payment agreement. Here’s is the NYC Department of Finance: Payment Plan Request Form that must be submitted to start the process. You must be the registered owner or the owner’s court-appointed agent. You must have at least 40 days left in the current registration. If approved, the plan will last only as long as the current registration. Any current or defaulted Payment Plans must be paid in full. Your vehicle has to have had proper insurance for more than 30 days. You must owe more than $350 in parking and/or camera violation judgments. Hearings on outstanding judgments must be completed. The New York City Department of Finance has a business finance center located in each borough. You can visit these centers to pay, dispute or inquire about your parking tickets. See below to locate your nearest NYC business finance center.